There's little doubt that the age of the postcard is pretty much over ... thanks to the Internet, I suppose. And it's too bad, because they're great pieces of Americana. Half a century ago, motels were among the most popular postcard subjects -- the cards were a great form of advertising, and were left in guest rooms and handed out at the registration desk. You still see a few of them, but they're a lot less interesting since motels are mostly corporate endeavors these days, and look pretty much the same. 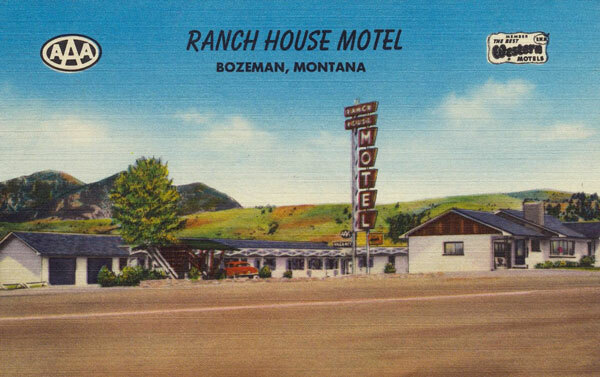 Here's a Montana postcard view from the 1950s. This is the Ranch House Motel along US 10 at the eastern edge of Bozeman ... and the cool thing about this card is that the motel (and the sign) still exist today.